By the time the end of the week rolls around I am inevitably running low on fresh ingredients and running out of ideas for dinner. This healthy chicken tortilla soup slow cooker recipe is one of my absolute favorites and is perfect for when you are cooking from your pantry ingredients! It’s made primarily of canned ingredients so there are no fresh ingredients required really. You’re sure to have these in your pantry. 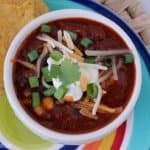 This soup is amazingly flavorful and it’s even healthy for you compared to other chicken tortilla soup recipes out there! Print the recipe off at the bottom of this page. My pantry is quite extensive but these are a few things I am never without! 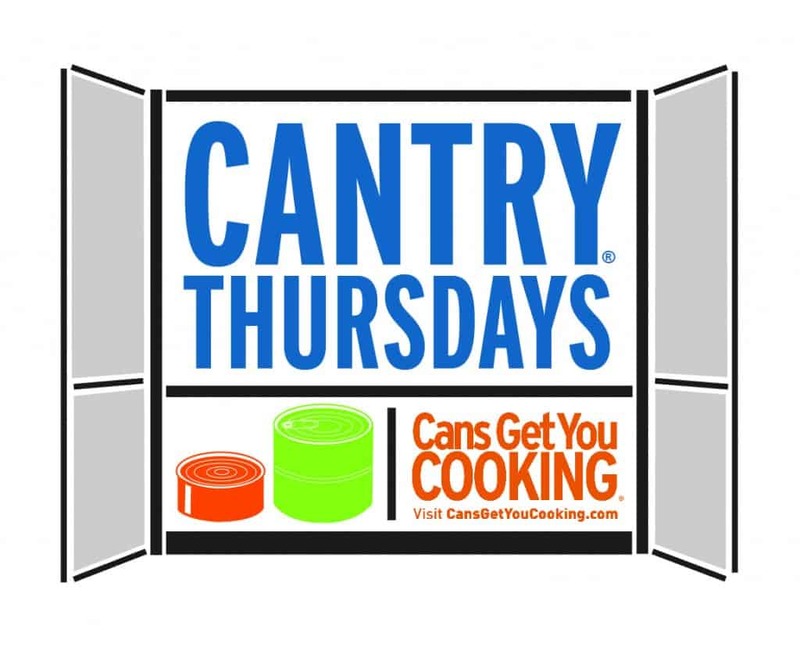 Cantry Thursdays aim to address the problem of what to make for dinner at the end of the week. Inevitably by Thursday we are usually out of fresh ingredients and it’s time to get cooking from the pantry instead of running to the store! February is National Canned Food Month so what better time than now to join in on the weekly challenge? People who frequently eat canned foods may have healthier diets than people who donʼt. An analysis of NPD data shows that adults and children who ate 6+ canned food items over two weeks were more likely to meet or exceed their recommended daily allowance for 17 essential nutrients than those who ate 1-2 canned food items over the same two-week period. I believe part of the reason this is true is because we are able to cook a healthy, nutritious meal from our “cantry” (ie- pantry filled with canned goods) rather than ordering takeout on those nights we don’t know what to cook. Get creative and cook from what you have on hand instead! Canned produce is on par nutritionally with fresh and frozen varieties, and in some cases even better. Studies conducted by researchers at Michigan State University, UC Davis and Oregon State University all concluded that canned foods have similar (or better) nutritional profiles as their fresh or frozen counterparts. 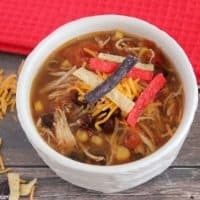 Let’s combine the ease of using your slow cooker with the convenience of cooking with canned foods and create an amazing, mouthwatering chicken tortilla soup recipe that will satisfy your cravings! 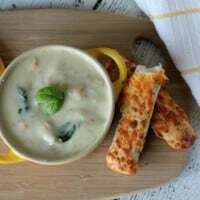 This is definitely my favorite soup and I can eat it for days! I usually make a double or triple batch and freeze the rest in individual portions. I use these freezer containers to freeze the soup in ready to eat portions. It will keep in a chest freezer for 6+ months. Print off the recipe below or pin it for later! 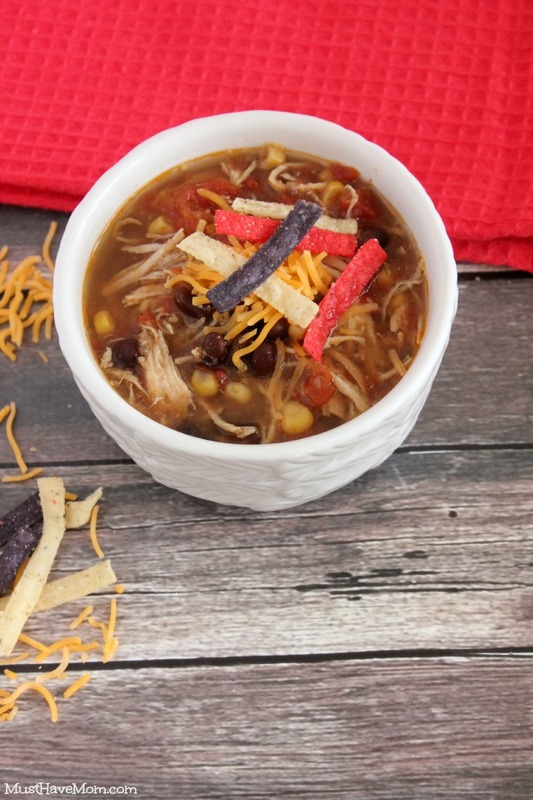 Easy, healthy slow cooker chicken tortilla soup recipe. Combine raw chicken, diced tomatoes with green chilies, diced tomatoes, corn, black beans, chicken broth, onion, jalapenos, garlic, cumin, chili powder, salt, and black pepper into a slow cooker and stir to mix well. At the end of cooking time remove your chicken breasts to a cutting board or plate and shred with two forks. 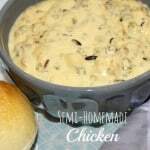 Return shredded chicken to the crock pot and stir. *Notes: I put frozen chicken breasts in and just shred them at the end. The chicken is so tender and moist! You can also put in fresh chicken breasts either whole or cubed. I just love how nicely it shreds, rather than cubing it at the beginning. Serve hot and top with tortilla strips and shredded cheese. You may also top with avocado, plain greek yogurt, cilantro, guacamole, etc. 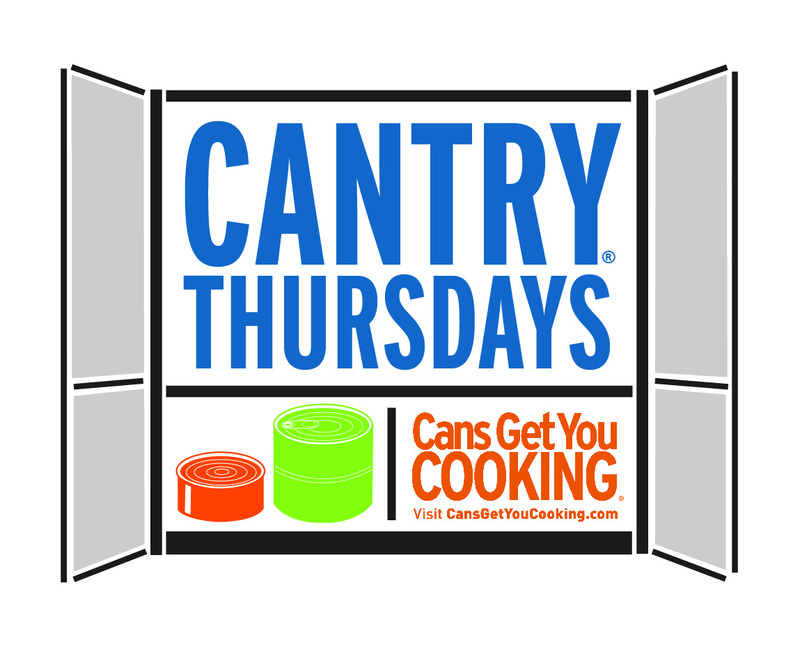 Visit Cans Get You Cooking for everything from delicious recipes to sustainability information. You can also follow Cans Get You Cooking on Facebook, Twitter, Pinterest, and YouTube! 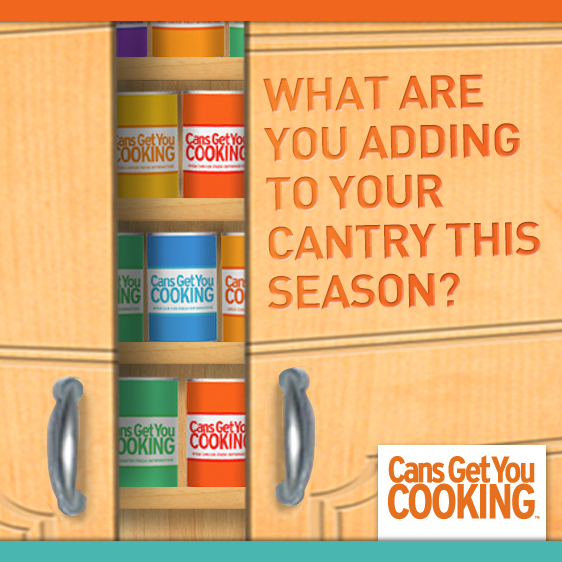 What one canned food item do you always have on hand? 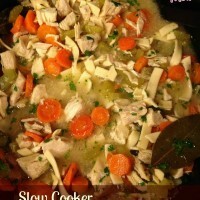 Slow Cooker Chicken Noodle Soup Recipe ~ Freezes Well Too! « Rocky Road Hot Chocolate Recipe + Snow Paint Sensory Bin! This looks so delicious! I like making soup in the Slow cooker and this one looks so fun to make! I will have to try it and see how it tastes! Great recipe for when it is so cold! I am a fan of anything I can make in my crock pot. I am definitely going to be trying this! This looks so good! I pinned it for later so I can make this for my family and I. Thanks for sharing! What a fun recipe using items out of the pantry! I have a small pantry because of space but try to keep canned beans on hand. This seems like a perfect recipe for them. I love everything about my slow cooker and the recipes that I make with it. This recipe looks great! I love using pantry items to make my recipes! This recipe sounds so delicious! I will have to try it. Yum that looks so good! I love making anything in the crock pot! I will need to try this! I really need to try making this. The next time I get some chicken I’m going to pop these ingredients into the crock pot early in the morning! This looks really really good! It would be a nice dinner to make before it gets hot. We call going through the food at the end of the month our own little Cut Throat Kitchen. This looks like something we could so do! Hhmmm that looks really yummy!! I can’t wait to try out this recipe for dinner!! I’m working on building my pantry up with staples, so appreciate your list of things to keep in your pantry! I am going to have to try tortilla soup, I’ve never made it before but we love Mexican food so I’m sure it would be a hit. I love this Mexican themed soup, this is something I will surely have to make for my family! This looks absolutely delicious! I can’t wait to try it out for myself since I ended up getting a slow cooker for Christmas. We’re actually starting to use less canned foods in our life. But this recipe does look really tasty. omg this sounds delicious!!! I love chicken tortilla soup!!! I might just have to give this a try! It’s nice that it’s a slow cooker meal. My husband is a huge tortilla soup fan. Oh yum – this soup looks filling and tasty. I like that it has corn, beans, and chicken. I bet it tastes really good. This is definitely something that I would eat. 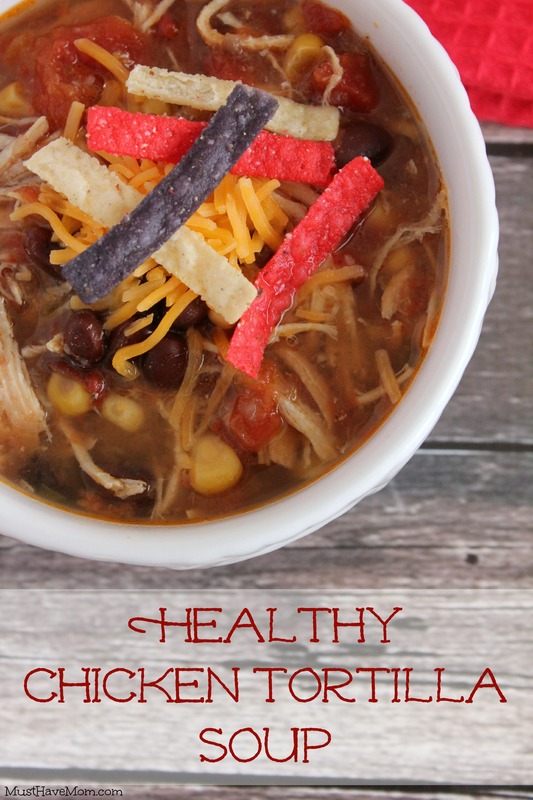 I love chicken tortilla soup and the fact you made this a healthier option is a plus for me! I have to try it out soon. 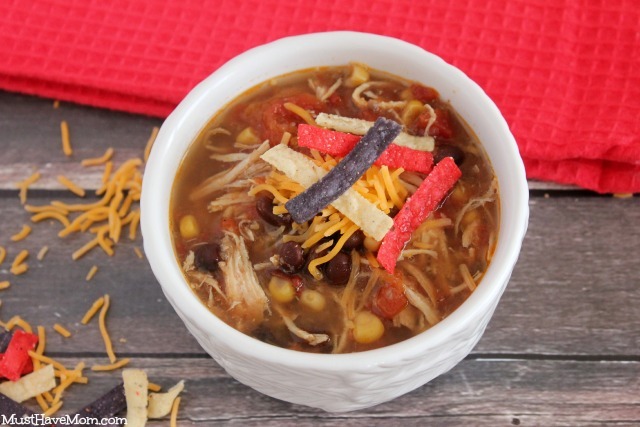 I love chicken tortilla soup plus it is so healthy and makes you feel warm after this cold snap! We love it in the slow cooker all day. I love using my slow cooker. Haven’t tried the chicken tortilla soup though. We love chicken and we love having soup at this time of year. That would be perfect! I literally just posted a recipe for this too! Yours looks amazing and I need to for sure work on my photography skills! Your pictures are incredible! I’ve actually never had this type of soup before! This one sounds really good. Looks delicious, and I love the idea that it is made with stuff I almost always have on hand! You can never go wrong with a big bowl of tortilla soup on a snow day. This looks like a great recipe. I love me some good tortilla soup and this one looks amazing. Since it is freezing outside this might just be what I make for dinner. Ooh, I love chicken tortilla soup! I haven’t had it in a while. I will definitely be adding this to our dinner lineup! I have always wanted to try chicken tortilla soup. I love that this is a healthy recipe and made in a slow cooker.